The May 1998 visit of His Holiness the Dalai Lama marked the historic culmination of three years of dialogue and planning. 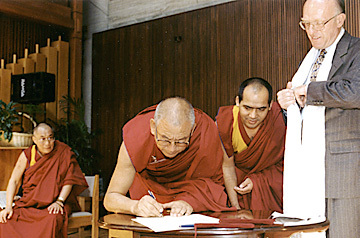 While visiting Emory University in 1995, he was approached by a faculty delegation to discuss the prospects of an affiliation between Drepung Loseling Monastery and Emory University. In response to his positive interest, the affiliation process was initiated. During these discussions it was decided that the best infrastructure for this arrangement would be a direct affiliation of Emory University with Drepung Loseling Monastery in India, as well as with Drepung Loseling, Drepung's North American seat. This would allow Drepung Loseling to design various programs both in North America and in India for academic accreditation through Emory. With this precedent-setting partnership, Drepung Loseling provides a unique link between the resources and faculty of a major American university and principal scholastic Tibetan monastery-in-exile in India. At the Inaugural ceremony held in Cannon Chapel on May 12, His Holiness the Dalai Lama remarked, "It is a great pleasure and honor for me to inaugurate this historic affiliation between Emory University and Drepung Loseling Monastery. I believe that this is a very historic moment, to see the forging of a relationship between two eminent institutions which represent both the best of the Tibetan tradition and the Western academic tradition. So I'd like to take the opportunity first of all to express my deep appreciation to all of those who have been involved in making this possible. And also I'd like to extend my congratulations. "I feel that given that this affiliation really marks first and foremost an academic relation... I personally see four key areas [cosmology, neurobiology, physics, psychology] of interface... and feel that is especially important for the Buddhist scholars and thinkers to study modern Western thought based on scientific understanding, so that they can enhance their own understanding of these various things. And for the scientists, hopefully, by engaging in dialogue with Buddhist thinkers, it may provide them with a new perspective, a new angle to analyze their own field. So, given my beliefs on these points, I have a very high hope that this new affiliation between these two academic institutions will be very enriching and successful." 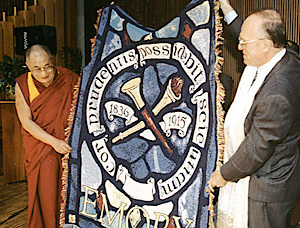 In his address, President William Chace commented, " The presence today [of His Holiness the Dalai Lama] reminds us of the aim of an Emory education - not to become a Buddhist monk, certainly. But to reach across borders, across traditions, across cultures with compassion and with curiosity, bringing all the good habits of heart and strong habits of mind to bear in the process. As we inaugurate the affiliation between Emory and Drepung Loseling, my hope is that the relationship will serve as both a port from which to launch our students and a lodestar to guide their hearts and minds." Following addresses by Abbot Konchok of Drepung Loseling, and Emory Secretary Gary Hauk, President Chace and Abbot Konchok signed the official affiliation documents. "Emory University is fortunate to be able to offer rich resources for the study of religion, and we have been privileged in forging links for transcultural understanding and scholarly interchanges between Western and Tibetan traditions. North America has experienced a remarkable growth in interest in Tibetan Buddhist learning. So it is auspicious that Emory and the Drepung Loseling Monastery can join in a quest for wisdom, insight, and understanding in a spirit of both critical inquiry and compassionate respect."